The perfect accessory for creating multiple stopped dadoes, grooves, molding bansaw cuts & repetitive drilling and routing operations. The 24" aluminum Extension Rail attaches to the top of the Rip Fence on your MARK V (510, 520 or later model 500) or the optional fence for later model Shopsmith Bandsaws. Just slide into position and lock with a quick twist of a knob. Twin washers hold the Rail parallel with the Fence when it's extended beyond the Fence end. Special flip-up Stop slides into the Rail and locks with a knob. 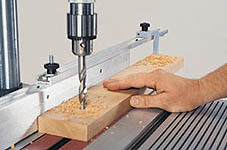 The Stops can be adjusted up to 32" from the center of the worktable on the MARK V Model 510 (310 on a Model 520). Fits on later Model 500's with T-slot on top. Flippers are reversible to work on either side of the Fence. Order extra Flippers so you can have multiple stops. You can double the usefulness of the 555807/8 kit with the purchase of the 555897 T-Slot track. then use our T-Bolts (555911) or T-Nuts (555916) to slide work-pieces into position and lock them there. Tighten or loosen the four flathead mounting screws (included) to “bow” the Track...widening or narrowing it to ensure a snug fit of the T-Nuts or Bolts - or your Miter Bar.